When I was about fifteen I asked the then Duke of Devonshire to give me his autograph. I had been collecting what I fondly believed to be autographs for some time and had no doubt that His Grace would oblige me with a signature. Instead the Duke took my book, wrote in it ‘You are a nuisance’, handed it back to me and turned away. I thought him rather unkind and pointed out that he had not signed it. This probably made him consider me even more of a nuisance, but if so he showed remarkable patience. 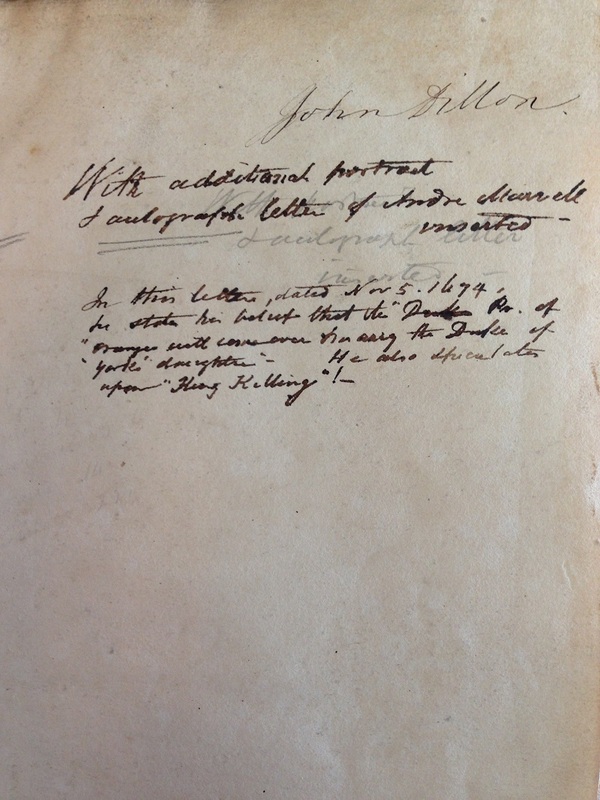 He took the book again and added his signature ‘Devonshire’, saying that I had not asked for his signature but only for his autograph, which he had in fact given me’. Rawlins summarised this lesson in a pithy chiastic maxim in Four Hundred Years of British Autographs (1970): ‘every signature is an autograph but not every autograph is a signature’. Called on J Dillon 31 Phillimore Gardens, who took me over his house. showed me his Collection of autographs. “J. Dillon” is John Dillon (d. 1868), a partner of Morrison, Dillon & Co., a haberdashery company on Fore Street, London. Previously, he had worked as a librarian for Charles Symmons (1749-1826), from whose ‘extensive Library’ he learned ‘something of Books’ (quoted in Caroline Dakers, A Genius for Money ), and had written a five-act tragedy Retribution, or The Chieftain’s Daughter, which was performed at Covent Garden in 1818; according to the New Monthly Magazine, although Dillon’s style was ‘disfigured by a recurrence of simile’, the play was ‘favourably received by the public’ and afforded ‘evidence of talents that possess strong claims to public encouragement’. We don’t know exactly when he and Cole first met, but both men were committee members of the Royal Society for the Encouragement of the Arts, Manufactures and Commerce from at least 1862. They would also have know each other from their membership of a committee established in 1862 to raise funds for a memorial to Prince Albert. What autographs might Dillon have shown to Cole that Sunday? 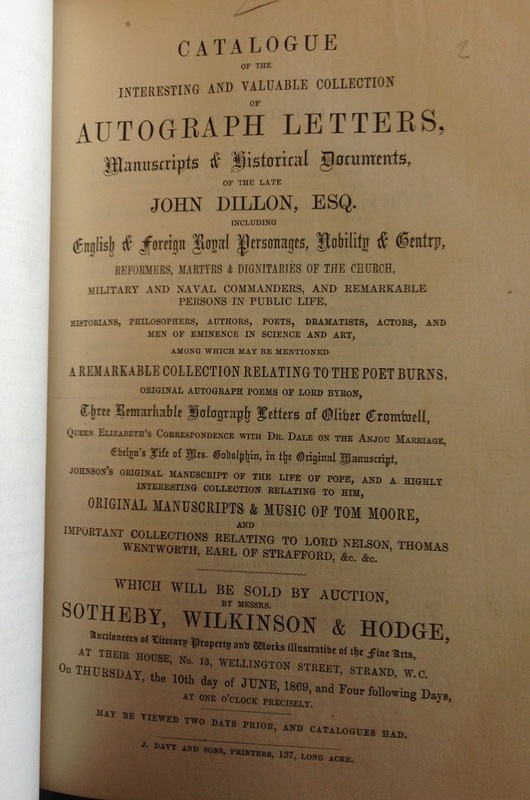 We can get a pretty good idea from the detailed catalogue that Sotheby, Wilkinson & Hodge printed to accompany their sale of Dillon’s collection, which they organised into 1031 lots, on 10-15 June 1869. 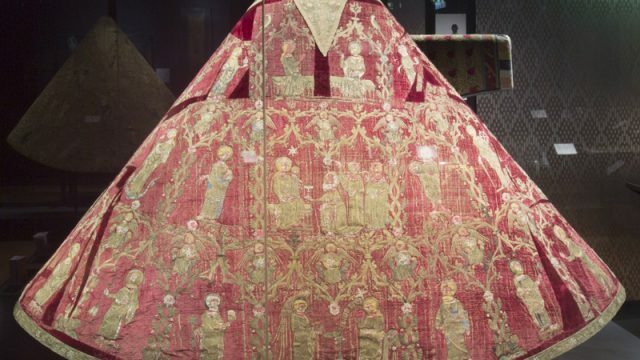 The catalogue’s extended (some might say verbose!) title conveys an enticing synopsis of Dillon’s wide-ranging and eclectic interests. Catalogue of the Interesting and Invaluable Collection of Autograph Letters, Manuscripts & Historical Documents of the late John Dillon, Esq. including English & Foreign Royal Personages, Nobility & Gentry, Reformers, Martyrs & Dignitaries of the Church, Military and Naval Commanders, and Remarkable Persons in Public Life, Historians, Philosophers, Authors, Poets, Dramatists, Actors, and Men of Eminence in Science and Art, among which may be mentioned a Remarkable Collection Relating to the Poet Burns, Original Autograph Poems of Lord Byron; Three Remarkable Holograph Letters of Oliver Cromwell; Queen Elizabeth’s Correspondence with Dr. Dale on the Anjou Marriage; Evelyn’s Life of Mrs. Godophin, in the Original Manuscript; Johnson’s Original Manuscript of the Life of Pope, and a Highly Interesting Collection Relating To Him; Original Manuscripts & Music of Tom Moore, and Important Collections Relating to Lord Nelson, Thomas Wentworth, Earl of Strattford, &c. &c.
Coincidentally, there is another connection between Dillon and the South Kensington Museum thanks to the National Art Library’s great benefactor John Forster (1812-76). The Forster Collection includes Forster’s personal copies of the sale catalogues of Dillon’s autographs, prints and engravings, and library. Furthermore, Forster owned a book that had once belonged to Dillon: we know this because Dillon signed one of the flyleaves. This copy of Miscellaneous Poems. 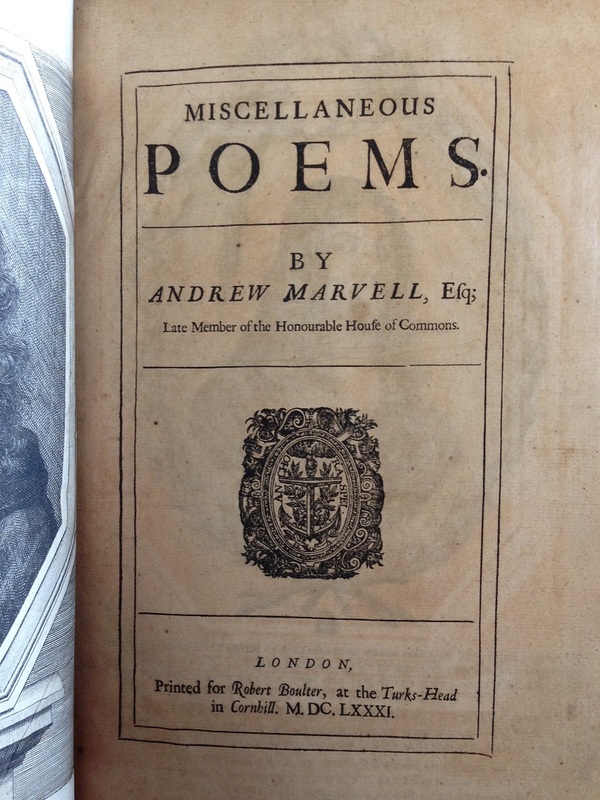 By Andrew Marvell, Esq; Late Member of the Honourable House of Commons (London: Printed for Robert Boulter, at the Turks-Head in Cornhill, 1681) is distinguished by the fact that it contains an autograph letter from the metaphysical poet and politician Andrew Marvell (1661-78) to “Mr. 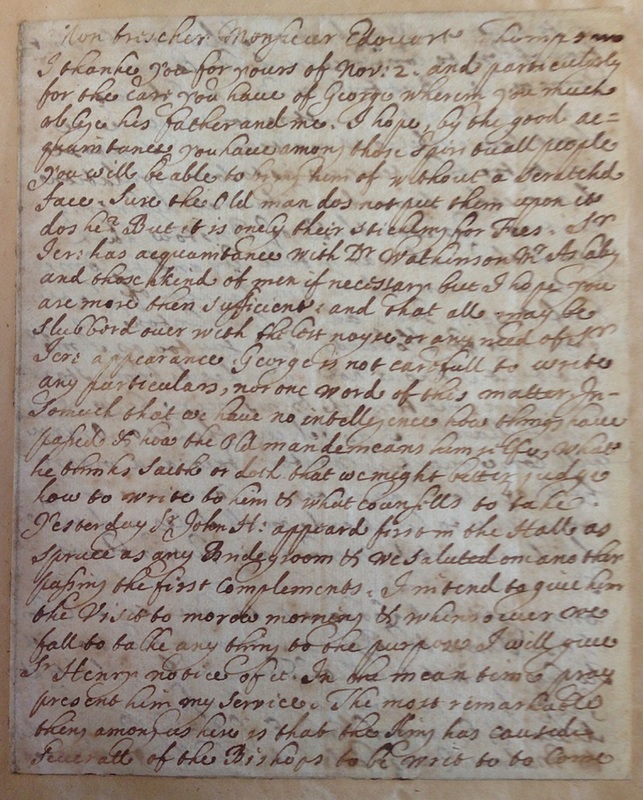 Edward Thompson Merchant Yorke”, dated 5 November 1674; this letter is listed as *MaA 549 in Peter Beal’s Catalogue of English Literary Manuscripts 1450-1700. 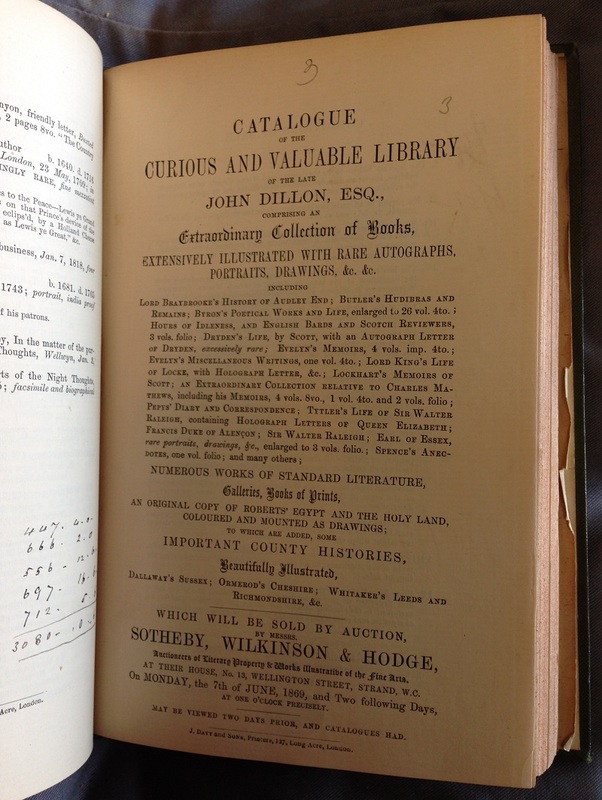 A frequent presence in the sale room, Forster must have acquired the book at auction, as it is appears as lot 378 in A Catalogue of the Curious and Valuable Library of the late John Dillon, Esq. comprising and extraordinary collection of books, extensively illustrated with rare autographs, portraits, drawings, &c (Sotheby, Wilkinson & Hodge, 7-9 June 1869). In view of the personal connections between Cole, Dillon and Forster, it seems fitting that a book from Dillon’s library should have migrated the short distance from Phillimore Gardens to Palace Gate House, where Forster resided, to the South Kensington Museum.